The beaches in Algarve are constantly ranked as some of the most beautiful beaches in the world. Dotted with sea cliffs with shades of yellow, red and orange, and crystal clear water, those incomparable beaches are some of my favorites in the world. 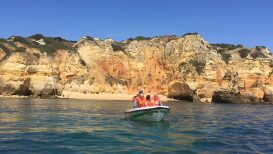 Below you will find a list of the three most beautiful and best beaches in Algarve and many other tips. Praia do Camilo, one of the best and most beautiful beaches in the Algarve. The first time I went to Algarve, in southern Portugal, was in 2008. 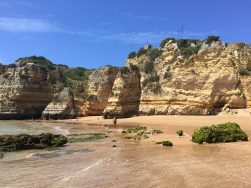 My mother was still living there and so, I spent one month enjoying the European summer and some of the best beaches in Algarve. Since then, I have been trying to go to Portugal at least every other year. The Algarve, aka the Golden Coast, is a very popular beach destination especially among English and Southern Spanish people. 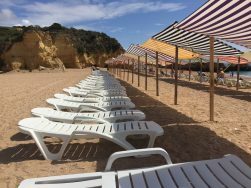 Every year from May to September many cities along the Atlantic Ocean coast such as Albufeira, Faro, Lagos and Vila Moura, receive tons of sun seekers and golf lovers. Where to stay in Algarve? The beaches in Algarve are dotted with sea cliffs with shades of yellow, red and orange, and have crystal clear cold water. 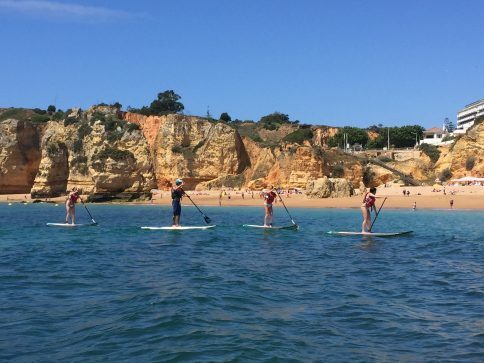 The Algarve boasts a Mediterranean climate and during the summer the average temperature is 28 C (83 F) and there is as much as 12 hours of sunshine per day. I love the Algarve, not only because of the breathtaking beaches, but also because of the tasty and cheap food. Every time I go there, I have a lot of fun with friends and family, and I endeavor to make new adventures. 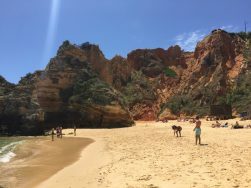 Thus I decided to make this short list with the three most beautiful beaches in Algarve, so the next time you visit Portugal, or plan a trip to this country, you should at least see these three special beaches. 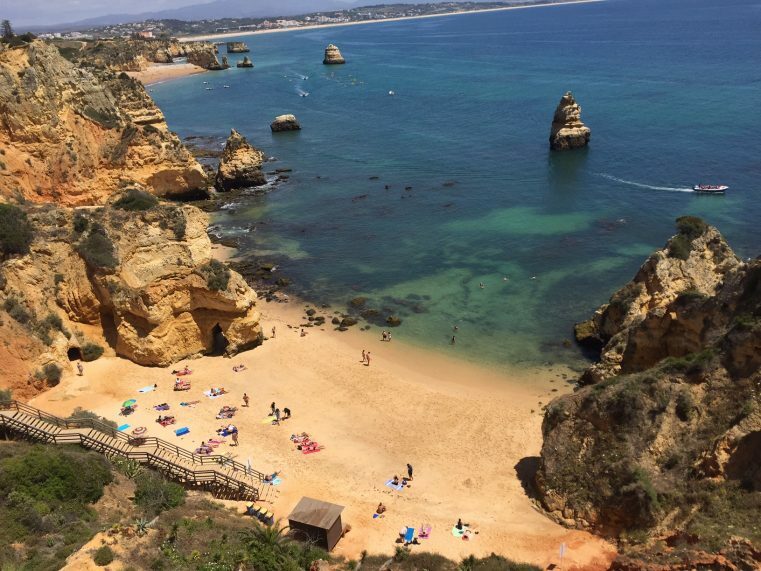 Located in Lagos, side by side with Dona Ana beach, Praia do Camilo is one of the most beautiful beaches in Algarve. This picturesque beach is framed by majestically tooled limestone rocks and provides astonishing vistas, whether you are on the cliffs, on the stairway, on the sand or even in the water. When I went to Praia do Camilo, I wished that I could have stayed there the whole day and it instantly became one of my favorite beaches in Algarve. The infrastructure is very basic and there is only one restaurant close to the stairway, which is really nice by the way. There are neither kiosks nor beach amenities at Praia do Camilo, so be prepared to take a cooler with water, booze and snacks. Praia do Camilo during the low season. View from the sea cliff. Yet another stunning and definitely one of the most beautiful beaches in Algarve, and I would say of the whole world. 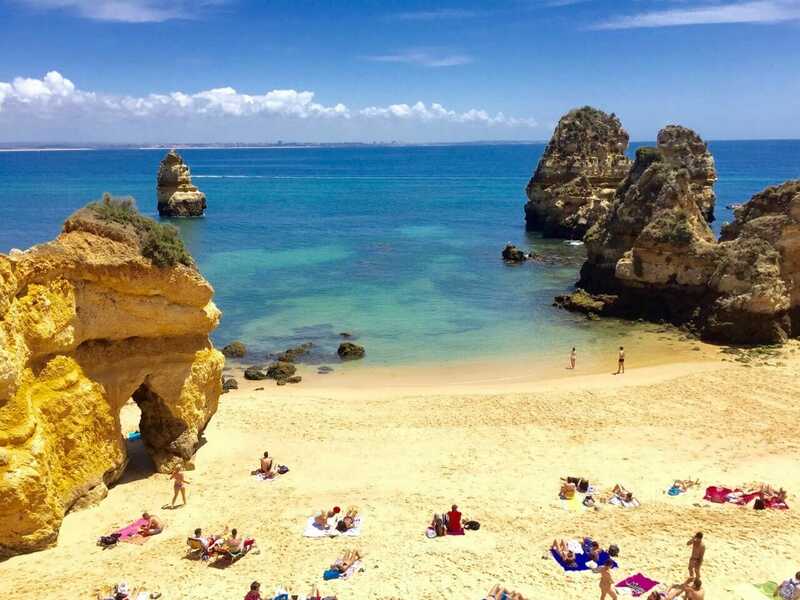 Located in Lagoa area, a half hour drive from Albufeira, this award-winning beach has been featured in many Portugal guidebooks and advertising campaigns. There is a large parking lot and once you step out of the car you understand why this beach was elected by Michelin Guide as one of the ten most beautiful beaches in Europe. It’s only accessible via a steep pathway along the cliff, and I bet you will stop every other minute to take tons of pictures, admire the striking views and catch your breath. 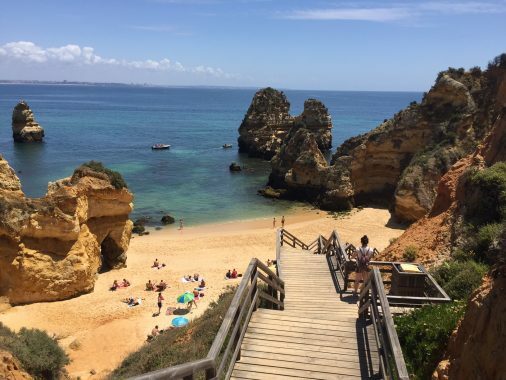 Praia da Marinha has amazing orange-yellowish limestone cliffs, golden sand and crystal-clear blue water. This beach looks so exotic and miles away from reality! The contrast between the azure water and the cliffs is just unbelievable! 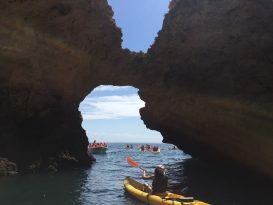 There aren’t beach amenities, but there is a restaurant and a café right at the beach’s entrance, and one of the popular activities is to take a kayak to visit other beaches and the Benagil cave, which is totally worthwhile. The breathtaking view from the steep pathway. 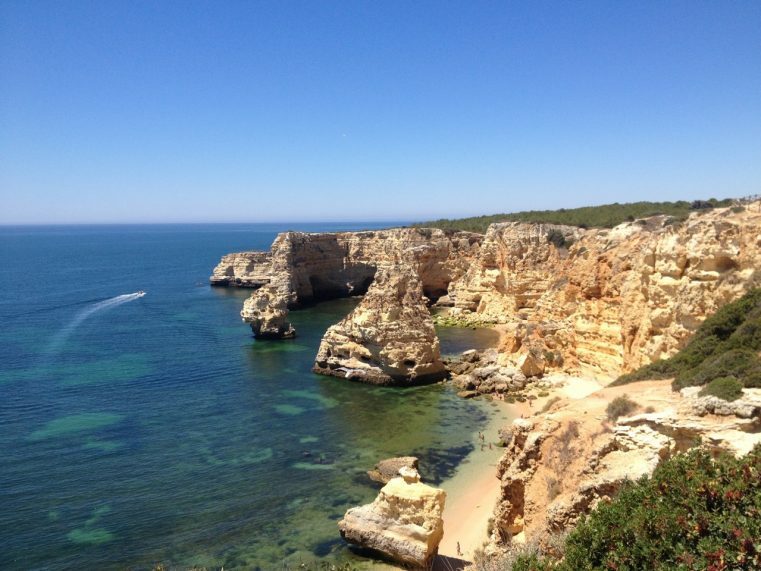 Praia da Marinha, a must-visit when plan a trip to Algarve. Praia da Marinha, one of my favourite beaches in Portugal. The spectacular Praia da Marinha, one of the best beaches in Algarve. 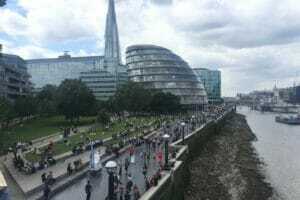 Some people might think that I’m crazy or disagree with me because I put the beach elected by Condé Nast Traveller in 2013 as the most beautiful beach in the world, as the last one of my list. 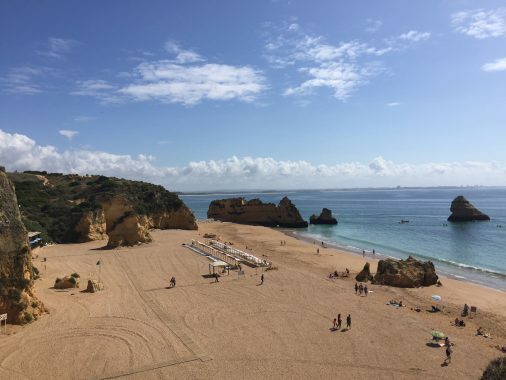 In fact Dona Ana beach is outstanding and for sure is one of the best beaches in Algarve, but its beauty is appreciated best from the sand, which is different from Praia do Camilo and Praia da Marinha. Located in Lagos, the access to this beach is made using the stairway, and there is a parking lot, beach amenities and a kiosk. There are beautiful limestone rocks rising up sublimely from the crystal-clear blue water, golden sand and orange cliffs covered with vegetation. Walking down to this beach is truly amazing and I felt really glad that I finally visited it. 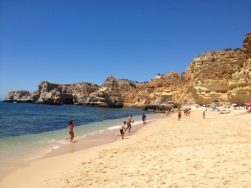 Praia Dona Ana is very popular among tourists and locals and it has been enlarged to better attend everyone. The most popular activities are kayaking, SUP and boat riding. I took the 40min boat trip but I personally think that kayaking on the sea stacks and grottoes is so much more fun. Praia Dona Ana after the extension. The orange-yellowish cliffs so common in the Algarve. Some of the beaches facilities. Kayaking is a great option for those who love adventure. SUP another good option for the adventure’s lovers. 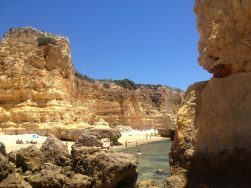 This is a very short list, with just three beaches, but there are many other impressive beaches in Algarve. Just to cite a few more: Praia de São Rafael, das Falésias and Santa Eulália (Albufeira), Benagil beach and cave (Carvoeiro), Praia da Rocha (Portimão) and Ilha de Tavira (Tavira). Porto: here’s a Travel Guide to Downtown Porto. Faro and Évora: Visit one of the bone chapels of Portugal. One week in Portugal: Top cities to visit. Safe travel and have fun in Portugal. Algarve is southernmost region of Portugal (check map here). Definitely during the summer and specially July and August. But if you don’t like crowds and heat, you should go June or September. There is an international airport in Faro, but the most popular is the one in Lisbon. From Lisbon you can take a bus or a train to the Algarve. The prices are basically the same and they take around 2h and half to get there. Some of the companies that fly to Faro are: Easyjet, British Airways, Ryanair and TAP. 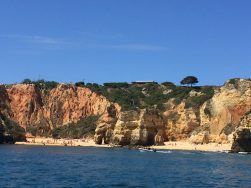 To get to Praia da Marinha by public transportation you need to take a bus to Lagoa and then another to Marinha Beach. 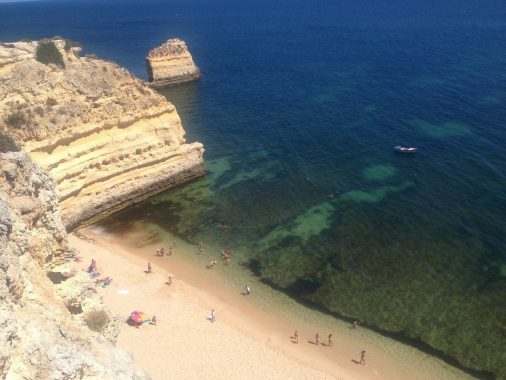 If you go by car, Praia da Marinha is around 40min drive from Albufeira and Lagos. You can rent a car with Rental Cars here with no extra costs for you. Budget: Apartamentos Turísticos Novochoro, Água Viva and Albufeira Beach Hotel. Great Value for Money: Hotel Topázio, Rocamar Exlusive Hotel & Spa, Hotel do Cerro and Grande Real Santa Eulalia Resort & Hotel Spa. Luxury: Salgados Dunas Suites, Pine Cliffs Residence a Luxury Collection Resort, Aqua Pedra dos Bicos and Agramar Beach Resort. Budget: Guest House Casa Sousa, Olive Hostel Lagos and Bela Vista Guest House. Great Value for Money: Lagos Uptown Bed & Breakfast, Don Manuel I Charming Residence, Baluarte Da Vila Apartments and Aldeia Azul Resort. Luxury: Villas Don Dinis, Cascade Wellness & Lifestyle Resort and Belmar Spa & Beach Resort. ∗ Bus from Lisboa to Albufeira with EVA: € 20. For more information about the Algarve visit the page: Visit Algarve. For the train schedule between Lisboa and the Algarve visit Rail Europe webpage. For the bus schedule between Lisbon and the Algarve visit Rede Expressos website. For the bus company to Praia da Marinha visit EVA website. * If you love beaches as I do, find out which are the 5 most beautiful beaches in Europe. Pingback: 7 of the Best Yoga Travel Destinations for Your 2018 Adventures | My Five Acres. Travel. Adventure. Yoga. I just emailed you with some suggestions 🙂 If you don’t get it let me know please (check you junk box first though). So glad to hear that you’re visiting Albufeira. Cheers and have fun in the Algarve.